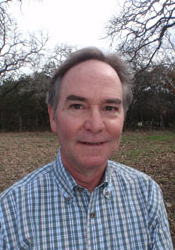 Rex Webb graduated from Baylor University in 1977 earning a BBA with a major in Finance and Management. In 1991, he started a steel fabrication and erection company, Patriot Erectors, Inc., which specializes in commercial, power plant, stadium, medical, educational, and defense projects, mostly in the southwestern United States. Rex is a member of Sunset Canyon Baptist Church in Dripping Springs, Texas. He and his wife of 33 years, Michele Sprague Webb (Baylor University, BA, 1978) have been very involved in the music and worship ministry at the church. Rex acted as lay minister of music on two different spans totaling approximately seven years and Michele started and continues to direct the handbell choir. Rex currently plays bass guitar in congregational music and sings in the church choir. He occasionally plays classical guitar for offertories or accompaniment for solos or small ensembles. Rex and Michele have two sons, Evan and Brandon, who graduated from Baylor and a daughter, Emily, who is currently a senior at Texas A&M University. Evan resides in Austin, Texas and is married to Shaylee Busch Webb and they have baby girl, Campbell, born October 2011. Brandon, who lives in Dallas, Texas, is engaged to Lydia Rogers, who is finishing her last year at Baylor Law School.